With Eco-Friendly R410-A Refrigerant - Does not affect the Ozone Layer! The AquaTherm AT110ADT, manufactured by Calorex, is designed to offer the highest possible overall cost effective operation and value - for the ultimate in swimming and spa comfort, with the added protection, durability, and value of Titanium! 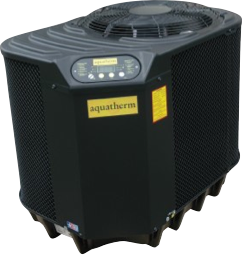 Top-of-the-line design, construction, and performance are the hallmark of the TITANIUM Series, AquaTherm's premier line of swimming pool and spa heat pumps - a collection of heat pumps where all the optimum features available today - come standard on the TITANIUM Series!!! Units installed in Florida and several other states have a 2 year labor, 7 year parts, and 15 years on the titanium tubing in the heat exchanger. Please reference the warranty for details for remaining states and outside continental USA.